It’s been a long time since we posted anything on our website but in the story of something that started life a thousand years ago a mere blip. First off: we want you to come on an adventure with us. Keep an eye here and follow our Instagram feed @norsvald, and we’ll speed you forward through the building of the boat and keep you up to date on plans for the upcoming launch. Are you interested to help in some way and figure out what “Power from Within” is all about? If so we want to hear from you especially if you live in the Seattle or Boston areas. Right now we’re getting excited about finishing our boat. We’ve given her a name: Polaris. It symbolizes all the things we care about: purpose and direction, evokes the strength of the north and celebrates the mystery of the stars. Many experts would assert that the original Vikings’ ships were ahead of their time. For the last many months we have been burning the candle at both ends tasked to prove with books and experts and math and computers that our ancient ship’s design would be strong in the eyes of the Coast Guard’s authority, steeped in today’s regulations. We are so proud and thankful that we’ve been successful in that regard. Following our “north star” of crafting the boat as close to authentic as tradition, workmanship and reputation demands has been big ask. In once sense it’s engineering. Great products don’t show up overnight — they have to be carefully planned and developed and that includes a lot of head-scratching and problem solving rewarded with insights and learning. Our work is no different; not rocket science, just Viking boat-building science! In another another sense, shipwright Jay Smith has been working pure magic. 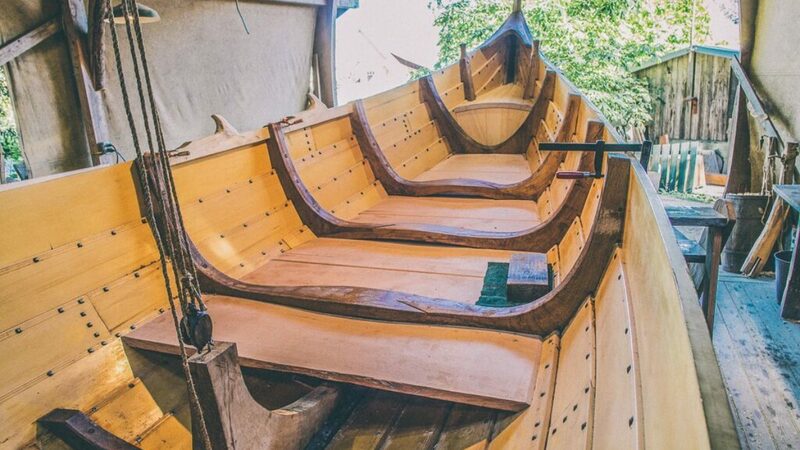 He has built an astonishingly beautiful boat that takes your breath away when you get up close. All the planking is completed and all the beams and knees have been fitted, and the floorboards being milled. Check out the gallery or instagram to see the progress. We’ve had to make some trade-offs around “vital systems” in the interest of safety and the wellbeing of our passengers. For Viking seafarers vital systems meant having a sail, enough oars, fresh muscle, food and ale, storyteller and perhaps a few birds in a cage. In the 21st century the birds are optional but communications, navigation and safety equipment are mandatory additions. Also, we think this will be the first Viking ship with an electric motor. Hidden away, quiet and discrete. We can even help charge the batteries by rowing. With summer approaching it’s a perfect time to think about launching Polaris and to start the next phase of our adventure learning business on the water.